what exact problem do the japanese have with my bike? Jesus, what is it with the Japanese? Exactly what argument do they have with me that means that they have to keep messing with my bike? Not three weeks have elapsed since they <a href="http://www.lightvesselautomatic imp source.org/diary/2005/11/they-stole-my-bike/”>stole my last one, and now they go and sabotage my new one: I leave it chained to a metal ring in the wall of the parking area of my building, and the Japanese — realising that this time they can’t steal it — decide that if they can’t have it then no-one will. They calmly, deliberately engage the wheel-lock, remove the keys which I, foolishly, left in to shave a few seconds off my morning run to the station, and they disappear into the night with those keys in hand and, probably, a little spring in their step at the deliciousness of what they’ve just done. Perhaps they stop along the way to drop my keys down a drain. Probably they do. I realise that leaving my keys in the wheel-lock was — with hindsight, and to a limited extent — foolish. The thought had even occurred to me that doing so would make it possible, in principle, for someone to lock my bike and thereby render it unusable. But I dismissed that possibility after a moments’ consideration, because it would be such a completely pointless piece of vandalism — the sort of thing you might expect from the English, or maybe the Belgians — but this is Japan, where it seems reasonable not to expect that sort of thing. And besides, the bike was barely even visible from the street. So I think it was one of my neighbours who did it. Probably it was the old man who lives next door who packs bin bags and stomps cardboard boxes flat on his balcony at two in the morning, and who I have good reason to suspect eats cats. The week before last, I went on a school trip with the whole first year, to a picnic site about half way up the island. The south part of the Okinawan mainland is an almost entirely built up expanse of towns running into each other, highways, American military bases, but the northern part of the island is mostly wild, densely wooded hills click to read more. Where we went was somewhere between these two: a bit of natural woodland about halfway up the island, next to a man-made picnic site and playground. While there I learnt that 13-year-old city kids hate nature (you’d have thought we were climbing Everest rather than scrambling for twenty minutes through — to be fair, somewhat mosquito-infested — woodland: “I hate this, I hate this”). After all the horrible ‘experiencing nature’ stuff was out of the way, the kids played on the picnic site’s aging toboggan run for a couple of hours, and then we had a skipping competition, where each class had to jump rope simultaneously. Ever since changing over to WordPress a few months ago, I’ve been meaning and failing to do something about the way things looked around here. 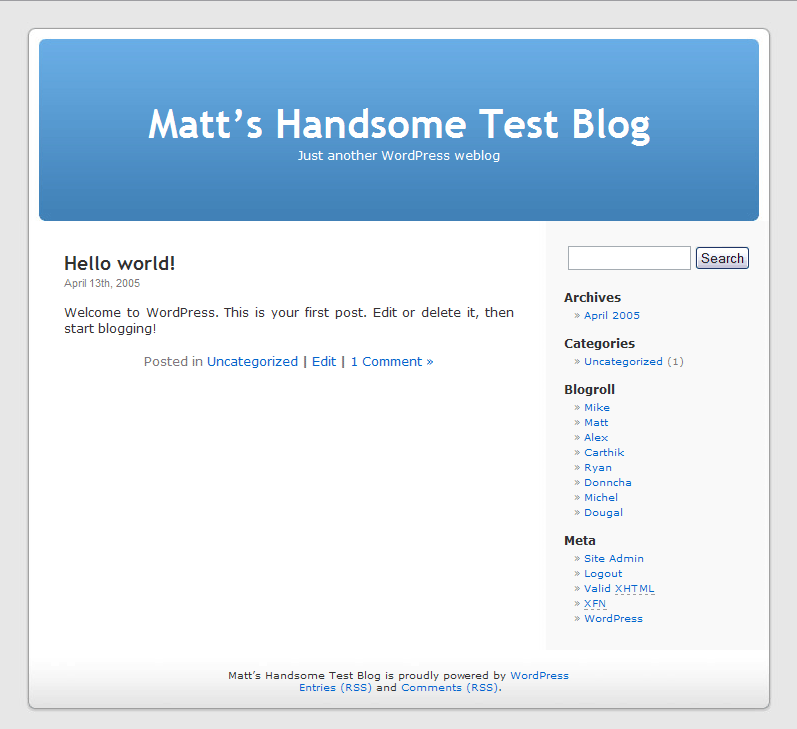 In the mean time, though, I’ve been stuck with WordPress’s default look which, while ok, meant that the place just didn’t really feel like home any more. It felt like living out of a suitcase in a flat that someone else has furnished — which by a strange coincidence is exactly what I’m doing at the moment. So there is probably a certain amount of transference of some sort going on here, but it’s a lot easier and cheaper to personalise a website than a flat, so here we are. Of course, I should really be writing my 1,700 words a day instead of doing this. Maybe I should take on these sorts of ridiculous obligations more often: when I’m procrastinating over one thing I seem to actually get other things done. I might be about 30,000 words behind schedule, but look! my website has a new look! The new look is sparser than before, partly because I’m a bit fond of the old minimalist look but mainly because I don’t have time at the moment to faff around with transparent drop-down menus like last time round. So: there’s not much to it, but at least it’s mine, and it should do for the time being, and now maybe I can stop living out of a suitcase. The bastards stole my bike. I left it there by the monorail station in the morning, and in the evening I returned to find it gone. To add insult to injury, the policeman refused to fill out any forms at all or take any kind of statement because I did not know the full name of the manager of the company I hired the bike from (his surname and mobile phone number, which I did know, were not enough for him to be able to satisfactorily fill in the form in question). Which makes me wonder how much of Japan’s low crime rate is attributable to things like its impressively even wealth distribution and high levels of education and social equality, and how much is in fact just a consequence of policemen avoiding filling out all the necessary paperwork. On top of this, I have a mouth ulcer. 6,265 words and counting. Writing them has been alternating violently between quite enjoyable and being a horrible, tedious slog. I should, by this stage, be on about 11 thousand and something, if I was writing my daily quota. But I was busy at the weekend, and wrote almost nothing. Today was probably the most enjoyable and productive day so far, so I’m hoping that things pick up from here. I still reserve the right to cut my losses and fold at 10,000 words though. But I’m not allowed to stop until I get there, so I’ll certainly be writing manically for a little while yet. Now. Apropos of nothing in particular, but just in case it’s of any use to anyone – a little while ago I came across a piece of photo-managing software called acdsee 8, which I have been finding very handy indeed for organising the several thousand digital photos I’ve taken since coming to Japan. It allows you to categorise and rank pictures however you like, and search by date, keywords, and so on. It’s the first piece of commercial software I’ve actually forked out for the full version of in a fair while. Also – while we’re on a computer-software tangent – just in case you didn’t know, the latest version of Opera browser has had the advertising removed from it, meaning it’s now a completely, no-strings-attached free browser, like Firefox. Only arguably rather better (depending, obviously, on personal tastes, blah blah blah). Very much worth trying, if you haven’t already. Enough of this boring nonsense! I am going to bed. Sorry. I will try to take some photos or be struck by lightning sometime soon. Tonight I took a break from the writing to go to the Shuri Festival, in the streets around Shuri Castle in Naha. The streets were packed, and ear-splitting bangers were going off everywhere. Ducking into a car-park to find somewhere calm to sit down with our beers, we saw one of the best things I’ve seen for a long time: a small boy whose mouth was full of lights. He had taken the genius step of putting brightly-flashing, multi-coloured LEDs in his mouth and was sitting talking to his friends with a mouthful of light. Who would have imagined a mouthful of light would even be possible? The first day of National Novel Writing Month is over, and my word count stands at 1198 words, the first of which is ‘The’, and the last of which is ‘restaurant’, followed by a full-stop. I’m 468 words short of my quota, but the 1198 words that I did manage were reasonably enjoyable to write. 29 days and 48,802 words left to go, if all goes according to plan. Now, though, I am very definitely going to bed.